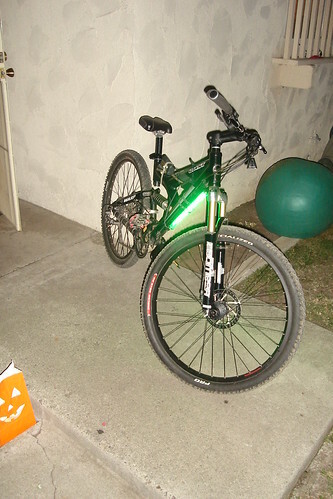 I decided to attach the Fossil Fool Down Low Glow to my mountain bike, a Giant Warp. I had to Mickey Mouse a few zip ties to make it work since the frame has wider diameter tubes. 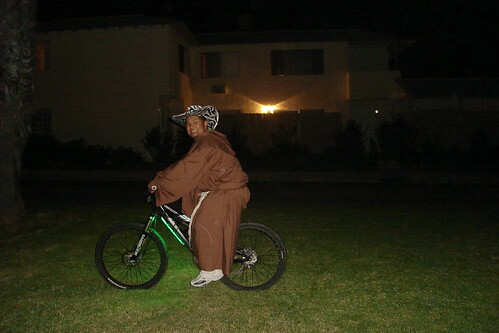 This is me with my costume and my bike. I’m a pimp’d out monk! Ever since I saw your first post I’ve been wanting one of those lights. Did you find the light distracting? Did it provide any additional visibility in front of your bike? Do you think it really does make traffic give you more room? I’d love to know before I officially put this on my Christmas list. The neon light isn’t distracting at all for me. But it does catch the attention of motorists. I like then alot and its funny how drivers will even slow down as they are passing you. So I guess it does its job by making people aware that I am right next to them.